The 70’ Viking is ready for tournament or recreational offshore fishing. 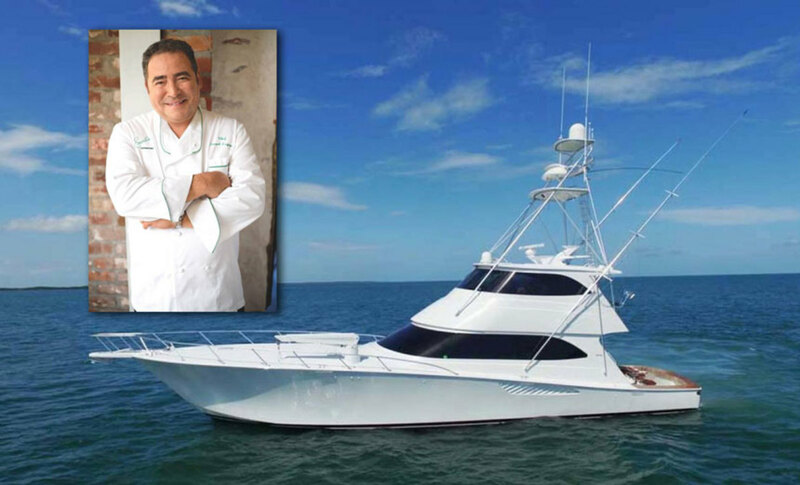 Celebrity chef Emeril Lagasse is selling his 2012 Viking 70 EB, Aldente, and according to a statement, has listed the boat with United Yacht Sales. He has purchased a 76-foot Viking that will fly the same name. The new boat is being customized to the needs of Lagasse and his captain Brad Benton. “I would love it if we could have it up here by late May before we start our tournament season,” Benton told Trade Only Today. Lagasse shut down the 70-footer just over a week ago. Benton said he had “a ton of phone calls and one showing” just a week after the listing. Benton first met Lagasse about 13 years ago when he was working on a 65 Hatteras that a cousin of Lagasse’s wife owned with a couple of partners. One of the partners wanted out and Lagasse took over his share. “Not long after, Emeril told me, ‘I want to do this on my own and I want you to come with me,’” said Benton. Lagasse takes his fishing seriously, but he also makes sure his friends have a good time when they’re on board, says Benton. As one might expect, Emeril does most of the cooking. Aldente has competed annually in the Mississippi Gold Coast Billfish Classic in Biloxi, Miss., the Emerald Coast Blue Marlin Classic in Destin, Fla., where the boat is based, and at the Blue Marlin Grand Championship in Orange Beach, Ala. Lagasse has also participated in tournaments out of Mobile, Ala.
Lagasse’s foundation hosts the Line, Vine and Dine tournament, which supports charities such as the ARC Broward Culinary Institute and the Dan Marino Foundation. When boat is in a tournament, Benton said Lagasse is the number-one angler on the boat. “That’s his getaway,” said Benton. Aldente is an enclosed-bridge Viking 70 equipped with a Seakeeper gyroscopic stabilizer and twin MTU 16V 2000 M94 2,600-hp engines, with just over 3,400 hours on them. The sales price is $3,995,000.